Why gateways are so critical to making the IoT work. Last month I discussed what new markets and winners IoT would produce. Sensors and devices, the edge, server chips and the cloud, are obvious winners. However, it’s not so clear who the winner is in the middle, the realm of gateways and embedded software. These technologies are critical to connecting existing infrastructure to the world of IoT and enabling a whole new category of IoT solutions. • VDC sees the market as divided between devices optimized for specific applications with limited functionality (IoT gateways) and devices featuring flexible software platforms for managing a variety of applications from the sensors to the gateways to the cloud (intelligent gateways). 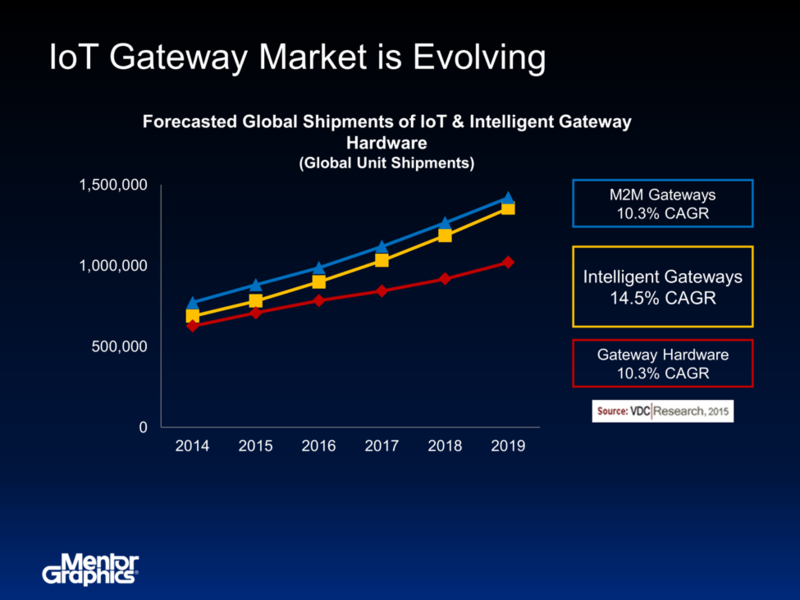 From 2014-2019, VDC expects unit shipment growth to be fastest for intelligent gateways (14.5% CAGR). • The report lists Cisco, CalAmp, Sierra Wireless and NetComm Wireless as the largest IoT and intelligent gateway suppliers, accounting for approximately 41% of 2014 revenues. A quick Google search reveals numerous other companies entering the arena, including National Instruments, Dell, TI, Engenius, Radisys and many more. Why so many gateway options? While it is possible to build a general purpose gateway that could meet every application need, such a device would be a large, power-hungry, expensive computer. IoT designers need solutions optimized for their specific requirements. ● Writing cloud-based applications to manage all the sensors, actuators and gateways as a system. A few weeks ago at ARM TechCon, ARM CEO Simon Segars was describing the overarching challenges of security and interoperability. Security is addressed in part by ARM’s TrustZone, where secure RTOSes and hypervisors help developers secure their solutions. Interoperability may sound easy enough, but consider the task of managing all the edge devices (that range from bare metal to intelligent sensors) via a network comprised of heterogeneous gateways with differing capability and functions — all of which feeds data to and is managed by a set of cloud applications. In fact, there will be billions of possible software and hardware configurations for IoT networks. Mentor’s entry into the intelligent gateway market, announced Nov. 5, offers the best of both worlds. 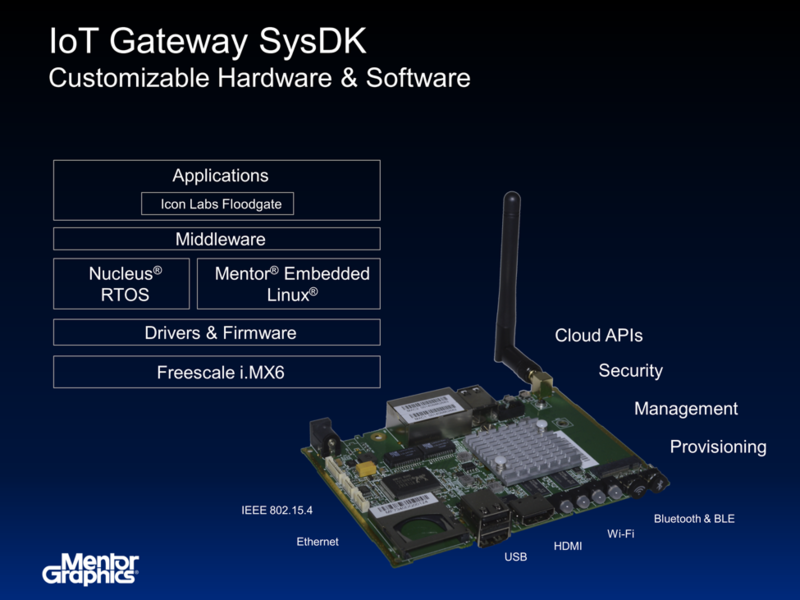 The Mentor IoT Solution is an IoT gateway system design kit (SysDK), ready for deployment and volume production out of the box; or it’s a starting point that can be customized any number of ways, including by implementing secure gateway partitions using ARM TrustZone to create edge-to-cloud security. The SysDK is a production-ready a gateway reference design, complete with EDA design files and tools, a complete embedded customizable software stack, intelligent gateway middleware and cloud-based applications for specific markets. The middle of IoT, intelligent gateways and embedded software, will produce new markets and may well produce a set of new leaders. Mentor’s on-demand Web seminar, “Strategies to Develop Secure and Robust Embedded Devices,” is available here.